Interview with author’s Michael Green and Matthew Bishop. Michael Green is an economist/writer based in London and graduate of Oxford University. Matthew Bishop is the US Business Editor and New York Business Chief of The Economist. Why is the price of gold risen so high? Is a new gold standard the way of the future? Or, what about a Keynes’ style global fiat currency managed by the IMF or World Bank? Why do hedge fund managers like John Paulson and Thomas Kaplan remain bullish on gold while others like Warren Buffet remain skeptical or disdainful of gold? Is it time for government to remove itself from monetary policy affairs and de-nationalize money as proposed by F.A. Hayek and Ron Paul? 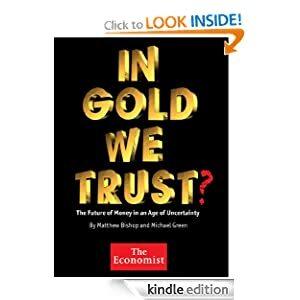 These are questions we discuss with authors’ of the new book, In Gold We Trust. Please tune in for this week on Radio Free Market with Hosts Aaron Brown and Special Commentator Andy Katherman. This entry was posted in All Archived Shows, Money. Bookmark the permalink.